The meaning of the name is "long lasting between heaven and earth"; construction of this garden started in the Ming dynasty; it has changed owner many times, and has seen both splendour and decay. After the Government funded its restoration in 1953, its original grandeur was restored. 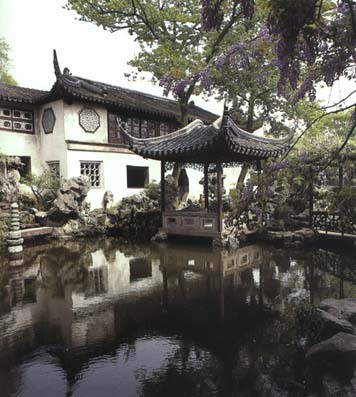 The garden comprises of four sections; its middle section was originally named "Hanbi Mountain Villa", and was the garden's quintessential part.The layout of this section was based on mountains and ponds. It was surrounded by mountains, rocks, buildings and pavilions, and had many long corridors and bridges penetrating its landscape. The western section was based on large rockeries ; it gave a rough feeling, and it had mountains clad with maple trees. The northern section had a view of natural mountain villages, using a bamboo picked fence enclosing a small garden of miniature trees with many famous species. The eastern section had many magnificent and spacious halls, pavilions and corridors; it also had large and small rockeries. All these formed a splendid garden area with alternating spaces, each with its own characteristics. This was particularly true of the courtyard built along "the Cloud Capped Peak"- a famous rock of south-east China which makes a deep impression. The entire garden is connected by corridors; walking along these many pavilions, verandas and terraces, strange rocks and clear streams, famous trees and special flowers; forming many small and large courtyards can be observed: A garden in a garden, a view in a view, making one forget to return; the Lingering Garden is truly a famous south-eastern garden. 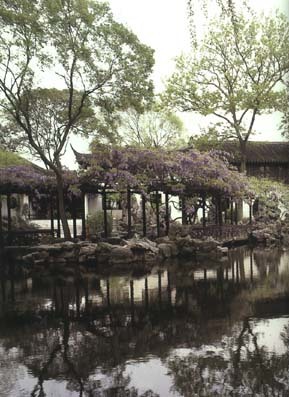 Liu Garden (Lingering Garden) is situated outside the Chong Men. 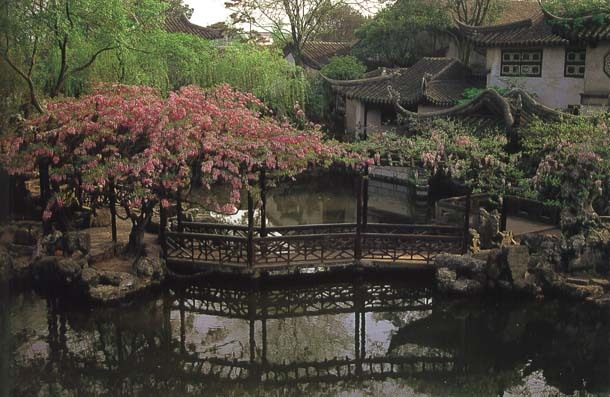 One of the largest gardens in Suzhou, it was built during the reign of Emperor Wan Li of the Ming Dynasty by Xu Shitai who named it Dong Yuan or East Garden. During the Jia Qing period of the Qing Dynasty, Liu Shu rebuilt it and changed its name to Cold Green Villa (Han Bi Shan Zhuang). Emperor Guang Xu refurbished it again and renamed it Liu Garden. Liu Garden is divided into four parts. In the middle is the site of the Cold Green Villa which is the chief beauty spot in the garden compound. The north, east and west parts were renovated during the Guang Xu era. At the site of the Cold Green Villa, built structures occupy most of the east part, encompassing Meandering Stream Mansion, Five Peak Hall for the Immortals (or Nanmu Hall), Crane Nest (He Suo), Bowing Peak (Yifeng) Pavilion and a study called Huanwo Dushuchu. Varying in size, these buildings stand together to make an interesting pattern, with galleries turning and zigzagging to connect them. To the west of the vilk site a miniature mountain is silhouetted against a lake. To the south of the lake are Greeny House (Han Bi Shan Fang) and Bright Clear Mansion (Ming Se Lou), which make up the most important scene in the site. Turning eastwards, one will pass the Green Shade Building (Lii Yin) and the Hall of Crisscrossing Ancient Tree Branches (Gumu Jiaoke) which are connected by a gallery to the Meandering Stream Bridge in the east. To the north of the lake is a miniature mountain and a grove, in the midst of which the tips of several pavilions can dimly be seen. In the middle of the lake is the Islet of the Immortals, with a bridge connecting it to the east shore. To the west is another miniature mountain, on the peak of which stands the Fragrant Wood Pavilion. From the pavilion, a view of the whole garden can be had. 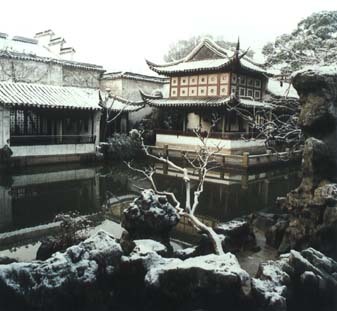 In the eastern part of the compound, the Hall for Hermits and the Respectful (Linquan Qishi Guan), Cloud Capped Terrace (Guan Yun Tai) and the Mansion of the Cloud Capped Terrace (Guan Tai Lou) cluster around a courtyard. 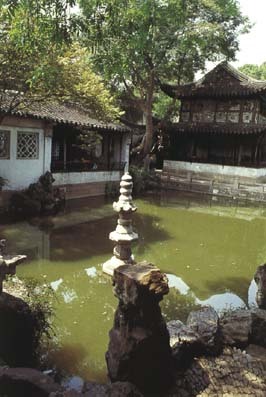 In the courtyard artificial peaks form the main theme with small ponds dotting all around. The tight organization contrasts greatly with the spaciousness of the central garden. Among the peaks, the Cloud Capped Peak is about nine meters high. Gaunt, creased with chinks and punched with holes, it is the only one of its kind in Suzhou. To the west is a hillock liberally planted with maple trees, scattered among which are tiny pavilions. Climbing this mount one can see Suzhou's famous Tiger Hill Pagoda. 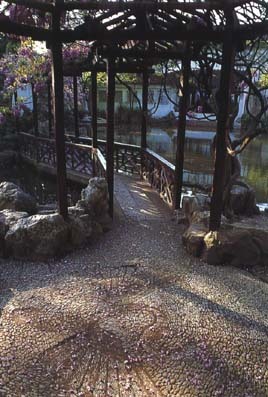 The design of the Liu Garden is very rich and complex. It is finely constructed, its layout carefully planned. This garden is especially famous for its wonderful utilization of windows and openings as the frames for beautiful views both close and afar. The Lingering Garden was listed from the first as cultural relics of national importance in 1961. With an area of 23,310 sq. m. it is celebrated for its artistic way of dealing with the spaces between various kinds of architectural form. 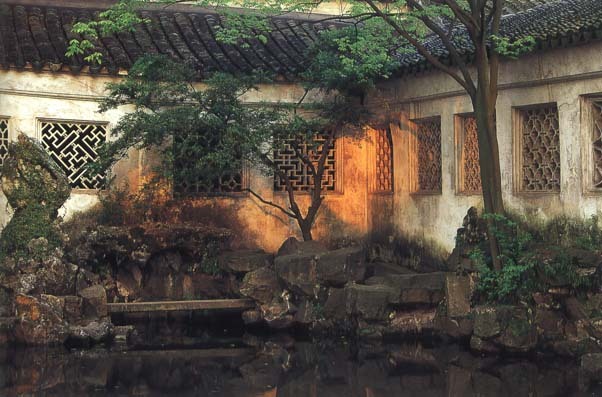 Buildings make up one third of the total area of the garden, the hall of which being the most remarkable in Suzhou. The garden is separated into the middle, eastern, northern and western parts. The ancestral temple and the house lie to the south of the garden. 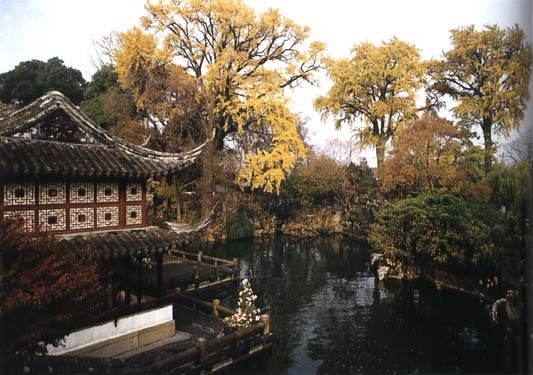 Featuring man-made mountain and lake scenery in the west and garden courts in the east, the middle part of the garden is the original site of the Xu's East Garden and the Liu's Hanbi Villa, and is regarded as the best part of the whole garden. 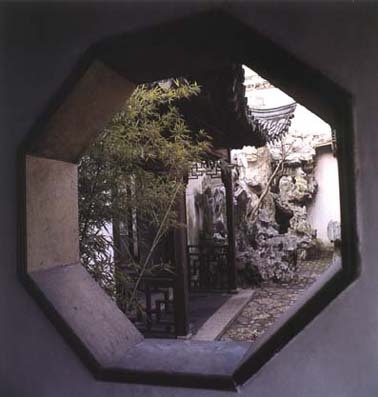 The eastern, northern and western parts are the extensions of the Sheng's Garden. The eastern part is noted for its strangely shaped limestones, the northern part idyllic scenes, and the western part the delights of woody hills. A winding roofed walkway behind the small entrance of the garden, while leading to the places of quietude, shows the masterly use of contrast between big and small, straight and zigzag, and light and shade. After strolling for about 50 meters, one can catch a glimpse of lattice-windows revealing a half visible landscape garden behind. Interestingly enough, the view is changing at every step. The middle part of the garden is centered upon a lake with man-made moutain in the north-west and a numger of attractive buildings in the southwest, such as the Hanbi Moutain Villa, the Pellucid Tower, the Green Shade Pavilion, the Zigzag Stream Tower, the Hao Pu Pavilion, and the Refreshing Breeze Pavilion by the lake. The mountains made mainly of yellowstones and earth, believed to be desigtned and piled up by Zhou Binzhong, look very much archaic and splendiferous. The admirable Crane House, the Small Garden of Stone Forest, the Return-to-Read Study in the east with the Celestial Hall of Five Peaks as the chief stucture are laid out in such a way that the indoor spaces have been brought into perfect harmony with the outdoor spaces. With an evocation of infinity, they are successfully made to be labyrinthine. Flanked by the Auspicious Cloud and Mountainous Cloud peaks, the 6.5-meter-high Cloud-Capped Peak, the highest limestone in the classical gardens of Suzhou, is believed to be left behind by the imperial collector of the Northern Song Dynasty, Mass of buildings, including the Old Hermit Scholars' House, the Cloud-Capped Tower, the Cloud-Capped Terrace and the Awaiting Cloud Temple, are put up to give emphasis to the Cloud-Capped Tower. The northern part is now a bonsai garden in which about 500 valuable bonsai are put on display. The western part of the garden sets a fine example of good-looking earthen hills studded with yellowstones and covered with maple trees. There is a winding brook lined with peach trees and weeping willows. The number of stelae in the Lingering Garden has never been surpassed by any other gardens in Suzhou. Superbly inscribed with the works of more than a hundred calligraphers in the Jin, Tang, Song, Yuan, Ming, and Qing Dynasties, these invaluable stelae bring to light the evolutionary course of Chinese calligraphy in the past 1,000 years. The whole garden possesses with pride 42 rooms and halls, a 670-meter-long roofed walkway, 200 lattice-windows of different kinds, 44 parallel couplets and stone carvings, 373 stelae, and 17 such valuable old trees as gingkoes, southern wistaria, etc. *Bus No. 5 to Hu Qiu takes the visitor right up to the gate of the garden. over by Liu Rongfeng, an official in charge of the province's finance, taxes and personnel matters. It was rebuilt and renamed Hanbi Shanzhuang (Cold Azure Mountain Village), also Liu Yuan (Liu's garden). 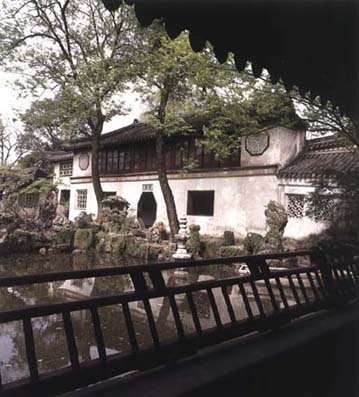 In the first year of reign (1875) of Emperor Guang Xu of the Qing dynasty, Sheng Xuren acquired the garden and, after renovations, renamed it Liu (meaning "linger") Yuan. During the Anti-Japanese War, the garden was reduced to ruins. In 1953, the people's government rebuilt the garden and restored its former splendor. Today it is a key cultural relic under state protection. Measuring more than 3 hectares in area, Liu Yuan may be divided into four scenic areas: the central area is characterized by limpid waters and quiet, secluded hills; the eastern area, double-eaved buildings, winding corridors and small courtyards; the western area, natural scenery; and the northern part, rustic scenery. Most buildings in the four areas are connected by a 7oo-meter-long winding corridor, which twists and turns with the terrain, spiraling up hills, spanning valleys, skirting ponds, or leading to secluded nooks. Liu Yuan has long been called "The First Garden in the State of Wu." Its characteristics are well-knit composition and infinite variety. Groups of buildings are used ingeniously to divide and compose the space into ever-changing garden scenes. Some of its highlights are as follows. Patterned windows: Six windows of different design embellish the entrance of the garden. Through them, the visitor indistinctly sees some of the garden scenes and is drawn into a world of enchantment. Lu Yin (Green Shade): This is the name of an area in the middle of the garden. Rockeries, terraces, pavilions and buildings are tastefully laid out around a pool. At the far end of the pool three giant ginko trees, believed to be more than 300 years old, turn golden yellow in autumn. Mingse Lou (Fresh and Clear Building): Turning right from Green Shade, the visitor sees a building like a boat built on dry land. This is Mingse Lou. Seen from across the lake, this building looks like the storied cabin in the stern of a pleasure-boat. When a breeze riffles the lake, it resembles a painted pleasure-boat cruising against the current. Han Bi Shan Fang (Mountain House Containing Azure), also called Lotus Hall, is the main hall in the central section of the garden. In front of it, a broad terrace stretches to a lotus pond. And looking northward from the terrace, one sees towering rockeries and ancient trees. In the courtyard to the south of the hall, Taihu rocks, flowers and plants of all seasons compete for the visitor's attention. Following the long corridor up the hill, one reaches Wen Mu Xi Xiang Xuan (Veranda for Smelling the Fragrance of Osmanthus) which commands an overall view of the middle garden. Passing a peony flower-terrace carved in the Ming Dynasty, the visitor comes to Wu Feng Xiang Guan (Enchanted Hall of Five Peaks) and the eastern scenic area. Wu Feng Xiang Guan, also called Nanmu Hall because the structural parts and furniture in the hall are made of nanmu wood, produces an effect of magnificence and elegance. The courtyard in front of it contains screen-like rockeries and a profusion of flowers and plants. The rear courtyard has beautiful winding corridors and mosaic paths. This hall is typical of the architecture south of the Changjiang River. 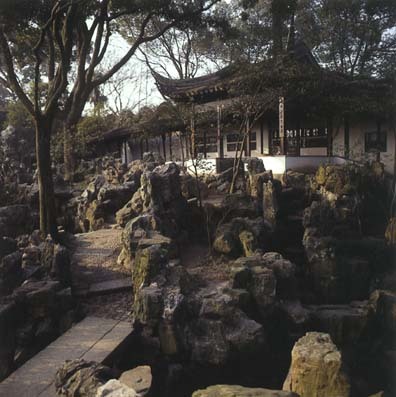 Yi Feng Xuan (Pavilion of Bowing Rocks), also called Shi Lin Xiao Yuan (Small Courtyard of Stone Trees), is adorned with winding corridors and an assortment of strangely shaped rocks. The delicate perfume of bamboo and flowers fills the courtyard. Three windows in the pavilion are like three pictures. Outside each of them is a small garden plot with bamboo and rocks. Set off against the white wall behind, they present tableaus reminiscent of traditional Chinese paintings. Lin Quan Qi Shuo Zhi Guan (Hall for Eminent Elders) is one of the three largest buildings in the garden. Architecturally it is ingeniously designed and magnificently constructed. Under its single roof rest two separate houses, each containing differently-styled doors, windows, beams and pillars. This hall is known as one of the best examples of building construction in traditional Chinese gardens. Guan Yun Feng (Cloud-Crowned Peak) is a 6.5-meter-tall Taihu rock weighing about five tons. Standing opposite the '. Lin Quan Qi Shuo Hall, this ornamental rock has all the four features required of Taihu rockery, i.e., it is lean, wrinkled, hollow and perforated. The manufacture of such rocks has a long history. Back in the Song dynasty more than 1,000 years ago, stone masons living by Taihu Lake brought rocks from the mountains and chiseled them into different shapes. Then the rocks were placed in the lake where the waves eventually rubbed them smooth. The saying goes that Zhu Mian of the Song dynasty originally intended to give Guan Yun Feng to the emperor for the imperial garden. But because it was too heavy, it remained in Suzhou. Beside Guan Yun Feng stand two other rocks, one called Rui Yun Feng (Auspicious Cloud Peak) and the other, Xiu Yun Feng (Mountain Cloud Peak). 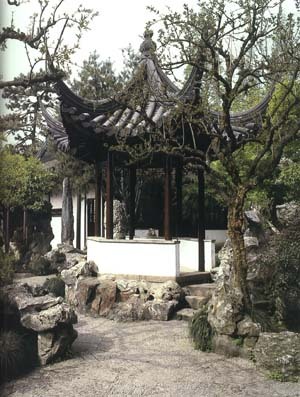 The three rocks are known as the "Three Peaks of Liu Garden." Around the Three Peaks are a number of buildings, each an elegant, secluded courtyard in itself. You Yi Cun (Another Village): Heading westward from Guan Yun Terrace, past Jia Qing Xi Yu Kuai Xue Ting (Pavilion of Clear Skies, Seasonable Rain and Gratifying Snow) and then traversing a winding corridor, one comes to the northern part of the garden. 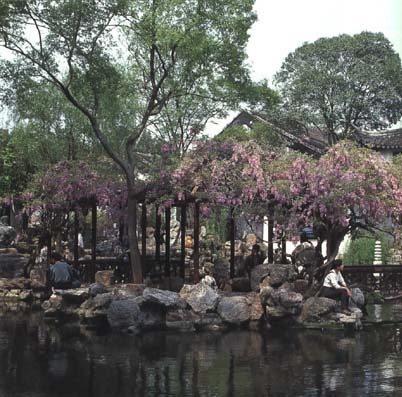 A winding path takes one to a spacious Chinese-rose nursery and, further on, to You Yi Cun, where one finds hundreds of "potted landscapes" - a comprehensive display of Suzhou's miniature landscapes. In the western part of the garden one sees a hill built up of yellow rocks. A flight of steps up the hill takes one to Shu Xiao (Shout for Joy) and Zhi Le (Ultimate Happiness) pavilions. By a small stream at the foot of the hill stands Huo Po Zhi Di (Place of Liveliness), a rustic waterside pavilion.